3D printing has lost its novelty value a bit, but new printing materials that MakerBot plans to release will soon make it a lot more interesting again. MakerBot is one of the best-known makers of desktop 3D printers, and at CES this week it announced that late this year its products will be able to print objects using composite materials that combine plastic with wood, metal or stone. 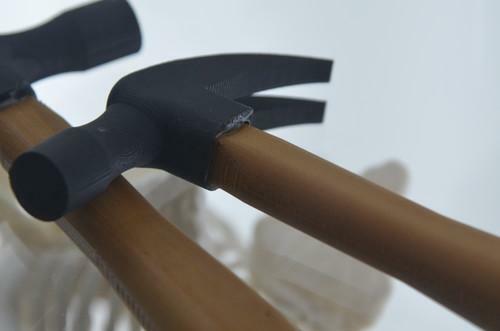 At CES, I handled a 3D-printed hammer made from composites of maple and iron, and I came away impressed. It was a bit lighter than a real hammer but still had some heft to it, and the surface of the wood actually looked and felt like wood grain. It even smelled of wood, because there is real wood in the composite. The iron head was a bit less convincing. The surface texture felt right, but it wasn't heavy enough to be iron and it was too warm; the brain expects metal to be cool to the touch. But still: this was wood. And iron. Coming out of a printer. It's pretty remarkable. If you're not familiar with how MakerBot's printers work, they use a long plastic thread, or filament, wrapped around a spool. The filament feeds into an extruder -- basically the print head -- which heats it to a liquid and pours it on the object being printed, where it solidifies again. For the new materials, MakerBot has figured out how to take particles of wood, metal and limestone and mix it with the plastic to form the composite filaments. An engineer at its booth wouldn't say what proportions of plastic to natural material it uses, which is probably a trade secret. MakerBot plans to release the new materials later this year. I didn't actually see the objects I handled being printed, and MakerBot didn't appear to be printing them at its booth. Besides the hammer, it showed off statues and busts from the limestone, and pots from the iron. The new materials will work with any of MakerBot's fifth generation Replicator printers, though users will need to buy a new extruder for each one.